What Should the Fed Do and Have Done? The Federal Reserve meets this week and has strongly signaled that it will raise rates. Given the strength of the signals that have been sent it would be credibility destroying not to carry through with the rate increase so there is no interesting discussion to be had about what should be done on Wednesday. There is an interesting counterfactual discussion to be had. Should a rate increase have been so clearly signaled? If rates are in fact going to be increased the answer is almost certainly yes. The Fed has done a good job of guiding expectations towards a rate increase while generating little trauma in markets. Assuming that the language surrounding the rate increase on Thursday is in line with what the market expects, I would be surprised if there are major market gyrations after the Fed statement. But was it right to move at this juncture? This requires weighing relative risks. A decision to keep rates at zero would have taken several risks. First, since monetary policy acts only with a lag failure to raise rates would risk an overheating economy and an acceleration of inflation possibly necessitating a sharp and destabilizing hike in rates later. Second, keeping rates at zero would risk encouraging financial instability particularly if there became a perception that the Fed would never raise rates. 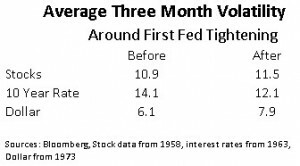 Third, keeping rates at zero leaves the Fed with less room to lower rates in response to problems than it would have if it increased rates. Finally, perhaps zero rates have adverse economic effects. Perhaps economic actors take the continuation of zero rates as evidence that the Fed is worried and so they should be as well. Some believe that zero rates are a sign of pathology and we no longer have a pathological economy and so no longer should have zero rates. Or perhaps there is a fear that when rates go up something catastrophic will happen and this source of uncertainty can only be removed by raising rates. These arguments do not seem hugely compelling to me. Inflation is running well below 2 percent and there is not yet much evidence of acceleration. Decades of experience teaches that the Phillips curve can shift dramatically so reasoning from the unemployment rate to inflation is problematic. Declining prices of oil and other commodities suggest inflation expectations may actually decline. Furthermore, if one believes that productivity is understated by official statistics one has to as a matter of logic believe that inflation is overstated. I have recently argued that this is quite likely the case given the rising importance of sectors like health care where quality is difficult to measure. Even if one assumes that inflation could reach 2.5 percent, this is not an immense problem. There is no convincing evidence that economies perform worse with inflation marginally above 2 percent than at 2 percent. Then there is the question of whether it is better to target the annual rate of inflation or the price level. On the latter standard it is relevant that inflation over any multiyear interval would still have averaged less than 2 percent. And I am not sure why bringing down inflation would be so difficult if that were desired especially given that it would surely take a long time for expectations to become unanchored towards the high side of 2 percent. It seems to me looking at a year when the stock market has gone down a bit, credit spreads have widened substantially and the dollar has been very strong it is hard to say that now is the time to fire a shot across the bow of financial euphoria. Looking especially at emerging markets I would judge that under-confidence and excessive risk aversion are a greater threat over the next several years than some kind of financial euphoria. The Fed does not have special information on where the economy is going and I find it highly implausible that its not acting would scare market participants if it explained its decision making. 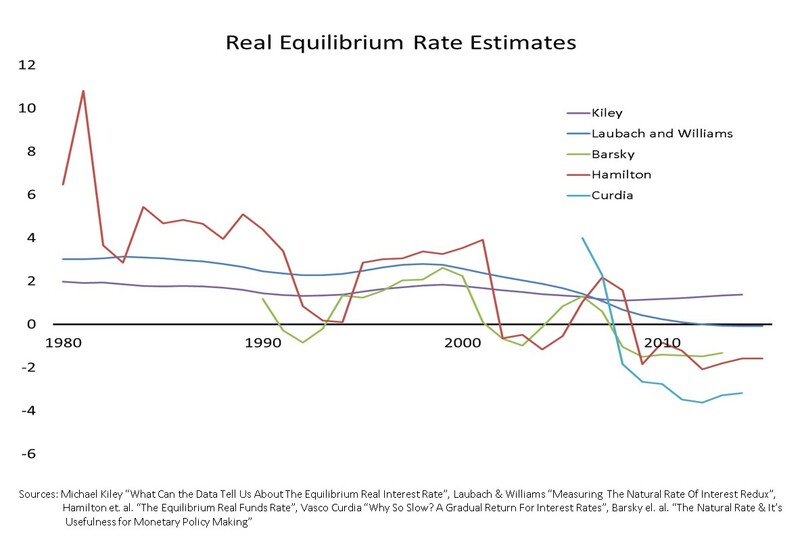 Given the now large body of research suggesting substantial declines in neutral real rates, it is an anachronism to believe that zero rates are only appropriate in pathological economies. A very important recent study from two Bank of England economists suggests that on a global basis neutral real rates are unlikely to rise much if at all in the next few years. As I noted in yesterday’s blog, the “temporary headwinds” interpretation of low neutral real rates has been wrong for the last few years and is not hugely plausible as a basis for predicting the next few. Historically volatility has been a bit higher for stocks and for the dollar and a bit lower for bonds after the Fed starts hiking than immediately before so I’m not sure of the basis for the belief that “getting it over with” would reduce uncertainty. Finally, the reload the cannon argument seems to me entirely specious. I know of no economic model where raising the average level of rates over the next few years raises the average level of output. Contractionary policy is contractionary and if there is a risk of a slowdown or recession in the next few years that is surely an argument against contractionary policy. What about the risk of raising rates? Certainly the risks of exacerbating financial instability or hitting the brakes when the economy is slowing look much less serious than they did in September. Nonetheless growth in the second half of 2015 may well come in at less than 2 percent. There is certainly a real risk that slow speed becomes stall speed becomes recession. On average mature recoveries like the present one last less than an additional 3 years. And given how low rates are and the political aversion to the use of fiscal policy a substantial slowdown could have very severe consequences. It is important to recognize in this regard that once the decline in neutral real rates is recognized policy is much less accommodative than is often supposed. Indeed on some measures policy rates now are above neutral. There is also the risk that inflation expectations start to anchor below 2 percent. This will happen if economic actors conclude as they reasonably can from what they are hearing that the Fed will cap inflation at 2 percent but allow it to fall below 2 percent in periods of economic slack. If anything the picture coming from survey measures of expectations, from the indexed bond market and from inflation swaps suggests that inflation is expected to remain below 2 percent for a decade. If projections were conditioned on the Fed’s intended path of monetary policy rather than what the market expects they would be even lower. And if account was taken of inflation mismeasurement they would be lower still. All of the argument about appropriate inflation targeting in recent years has focused not on whether 2 percent is too high but on whether it is too low a target. I am not yet ready to abandon a 2 percent target but wage rigidity and zero lower bound on interest rate considerations suggest whatever the right target was a decade ago, a higher target might be appropriate today given the slowdown in productivity and reduction in the neutral rate. Surely the risks of missing the target on the low side over a prolonged interval should be a major policy concern today. This is a time of considerable financial and geopolitical fragility around the world. There are real risks of serious capital flight and associated dislocation in many emerging markets. Any change in policy and financial conditions carries with it at least some chance of setting off instability which could snowball given the current high degree of illiquidity in many markets. The risks are magnified by the asymmetry between what the Fed is doing and what most other major central banks are doing. While in principle exchange rate movements should not affect the level of global demand, further dollar appreciation is likely to be contractionary for the global economy because of the uncertainty it engenders. On balance the risks of raising rates seem a little more likely to play out and much more serious than the risks of standing still on rates. Moreover, given the inevitability of mistakes prudence dictates tilting towards making errors that are reversible. An excessive delay in raising rates can be remedied eight weeks later at the next FOMC meeting by raising them then. On the other hand, if rates are raised and it proves to be a mistake there are likely to be substantial costs as inflation expectations move down, financial turbulence ensues, and the economy possibly tips towards recession. Reversing the rate increase would be unlikely to eliminate these consequences. Moreover, reversing the direction of policy would hardly be helpful for central bank credibility as the central banks around the world who raised rates and then were forced to reverse themselves have discovered. Reasonable people can come to different judgements on all of this. I think on balance it was a mistake to lock in a December rate increase though the argument is closer than it was in September. But that decision has been made. I hope the Fed will not now invest its credibility in signaling further increases until and unless there is much clearer evidence of accelerating inflation. I hope it will also emphasize the two sided character of the 2 percent inflation target to mitigate the risk that markets will think the US has an inflation ceiling rather than target. Finally, I hope the Fed will signal its awareness of instability and risk of growing problems in emerging markets.